With the travel season upon us, it is important to remember that a safe, pleasant trip begins well before you leave your home. It starts with preparation. It seems that every year, we handle cases that unfortunately involve serious automobile accidents which have occurred during travel and vacation time. While even the best of precautions will not prevent all harm, the following travel tips can help to assure safe travel and peace of mind while on the road. Your vehicle is, of course, the key to a successful motoring vacation. 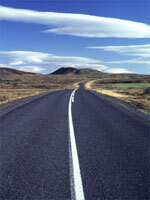 Whether car or R.V., it is essential to be sure that the vehicle is in excellent condition. If the engine needs a tune up, have it done before the trip. (This will also enhance your mileage and vehicle performance.) Change the oil and oil filter, have the brakes and steering mechanisms checked, as well as the alignment. See to it that the tires are in good condition — including the spare tire. (Remember that tires often wear much faster at the end of their tread life, so replace them before a long trip if they are going to need it in the near future.) Your mechanic should also inspect tires, fuel and air filters, ignition wires, belts and hoses, brakes, transmission, battery and cables, radiator and windshield washer fluids, windshield wiper blades and lights (including brake lights). If you will be towing a trailer, check the brakes and cooling system, the tow hitch, and the trailer lights (including brake lights). The above list, while not all inclusive, should ensure a good start and a successful completion of your trip. Every traveler should practice common sense and courtesy while on the roadway. Important tips include the following: By far, the most important safety tip is to drive safely and carefully. Leave plenty of room between your vehicle and others — especially large trucks and R.V.’s whose drivers often cannot see you due to large blind spots. Do not ever demand the right of way and always use courtesy to avoid altercations with others. Avoid fatigue by taking frequent breaks, changing drivers, and keeping the vehicle well ventilated. Do not overload or overcrowd your vehicle, which can affect safety of steering, braking and handling. Be sure windows are clean and clear of obstruction. Take extra care when driving at night, on mountain roads, or in adverse weather conditions. If traveling with children, insure that they are safely restrained (whether in child seat, booster seat, or seat belt) and that they understand not to distract the driver. Carry emergency equipment such as first aid kits, flashlights, flares, fire extinguisher, jack and lug wrenches. Do not carry large amounts of cash. Instead carry travelers checks and credit cards. Be aware of your surroundings to avoid thieves and other bad actors. Lock your car at every stop. Never leave your unlocked car unattended. We hope that these suggestions help make your trips this summer both fun and safe.